The Golden Saber .45 ACP 185-grain +P JHP penetrated ballistic gelatin 12 3/8 inches. The bullet created a large, symmetrical stretch cavity. This is about as good as it gets. Remington is one of the most recognizable names in the shooting world and they got in the hollowpoint .45 game early in the race. Aimed at defense and light hunting, their initial +P .45 ACP load consisted of a good looking 185-grain JHP that would leave a standard length five-inch barrel doing 1,150 fps or so. 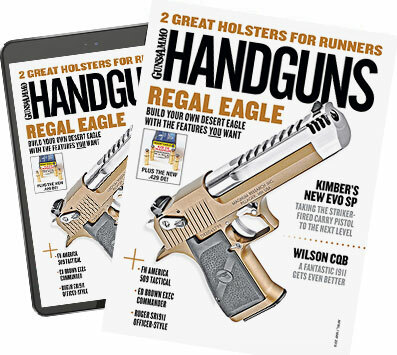 Today, Remington takes the .45 ACP up one more level with the introduction of the Golden Saber line that includes a bonded, law enforcement only load, as well. Remington's Golden Saber bullet features a copper alloy jacket and a deep hollow point. The jacket features half a dozen deep serrations around the circumference of the hollow point to aid expansion. The Golden Saber bullet also features a novel shape, as well. Swaged to a "Driving Band profile," the bullet features a larger driving band that engages the lands and grooves and seals the bore while the front two-thirds of the bullet is reduced in diameter and only lightly engages the top of the lands. The shape is aimed at reducing friction and bullet deformation in the bore while also tending to lock the solid lead core in the jacket, as well. Remington uses nickel-plated cases in all of its Golden Saber loads and the bullet is sealed to the case with an asphalt-based sealant. The primer is also sealed with a lacquer sealant, making Golden Saber loads weatherproof for the duration. Remington currently catalogs 11 loads under the Golden Saber brand and this ammunition is available over the counter to civilians. The firm's Golden Saber Bonded brand is available in four calibers and is designated "Law Enforcement Wholesale only" by Remington. Remington's Golden Saber 185-grain .45 ACP load is cataloged under Remington's GS-45APC index number and is available in boxes of 25 or case lots of 500 rounds. After this test, we'd take a case, please. This Golden Saber bullet has a bullet core constructed of a 99.25 lead/.75 percent antimony and the load is primed with Remington's No. 173 primer. Rated a +P, this round gets your attention, pronto. Muzzle blast and flash is spectacular to say the least. Remington's Golden Saber +P .45 ACP load takes the old War Horse to a new level. The recovered bullet expanded to .749 inches, and exhibited perfect weight retention, weighing 185.5 grains. Over the course of several weeks I managed to run more than 100 of these loads through three very good .45s and throughout the test I experienced not even a hint of a malfunction either in the Ransom rest or my hands. While this load didn't tend to exhibit target-grade accuracy from the three rigs, the load isn't intended for such work, either. The Les Baer Custom Carry five-inch gem launched this steamy load at just over 1,100 fps, generating over 500 ft-lbs of instrumental energy in the process. Out of the Ransom rest, the Baer gun accounted for five 5-shot groups that averaged 3.68 inches. I also ran 25 of these loads through the Baer rig off of sandbags and these five groups averaged a more respectable 2.7 inches center to center. The second rig is a Kimber Custom target and this arm didn't much like the load, right off the bat. The Kimber accounted for an average 5.08-inch group at 25 yards. The surprise in the test came when I clamped the new Para-Ordnance Companion in the Ransom rest and had at it. The stubby 3.5-inch Companion launched this load at 1,021 fps, accounting for 428.1 ft-lbs of instrumental energy. I was running short of ammunition at this point and only managed to run four 5-shot groups down range with the Companion, but the four groups averaged 2.68 inches center-to-center. I used the pet Baer five-inch rig to run this load into the gelatin block and the Remington performed perfectly. The shot measured 1,128 fps two feet in front of the gelatin block and the bullet penetrated 123⁄8 inches before stopping. The stretch cavity was huge and symmetrical and must be graded with perfection in all respects. The recovered bullet measured a tick under .750 inches in diameter, achieving 166 percent expansion and weighed 185.5-grains--probably its starting weight. I'd have to grade this performance stellar in every respect. The Strasbourg Team managed to blast several Alpine goats with this .45 load and it ended up in third place right behind two frangible loads (MagSafe and Glaser). While I often say, "past results are no indication of future performance," this load goes where it's pointed and the bullet does exactly what Remington predicts in ballistic gelatin. I'd pick this load in a heartbeat.